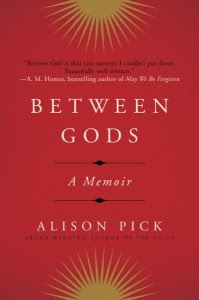 Engaged to be married to her longterm boyfriend but in the grip of a crippling depression, Alison began to uncover her Jewish heritage, a quest which challenged all her assumptions about her faith, her future, and what it meant to raise a family. An unusual and gripping story, told with all the nuance and drama of a novel, this is a memoir illuminated with heartbreaking insight into the very real lives of the dead, and hard-won hope for all those who carry on after. This book is beautifully written. Pick is a poet and her writing is reflective of that. Her language is nuanced and lyrical but she doesn't come across as overly descriptive or flowery, which is important to me. One of my sticking points in reviewing memoir is that the author show honesty and an attempt to reveal themselves, even if it's not always pretty. I think Pick succeeds at that entirely. She reveals both the good and the bad and doesn't ever seem to censor her story to portray herself or others in a more positive light. Her thoughts and insights into her own emotional and spiritual states are beautifully portrayed and conveyed to the reader with style and emotion. Religious conversion novels always draw me in. I gravitate towards conversions to Christianity, since that's my own religion, but I enjoy any book that gives me insight into the reasons people choose the spiritual paths they choose. So many aspects of this memoir in particular appealed to me. It taught me a lot about Judaism, which is the first thing I'm looking for in any religious memoir. First and foremost I want to know what they believe and why. Secondly, it gave me some insight into a religion that isn't just based around what you choose to believe but about who you are ethnically. At first I wondered how Pick could be so conflicted about Judaism and her identity. In Christianity, the focus is so much on what you believe. Do you or don't you? Simple. But as the book continued I felt like I really came to understand how much more complicated beliefs are when it's an issue not just of what you choose to believe in but of ethnicity and identification with race and a history of persecution. I became much more sympathetic to Pick's struggle with who she really is as she learns more about Jewish history and what it means to be Jewish. I definitely think this one is worth reading if you're a fan of memoir or have any interest in Christianity and Judaism or religions and conversion in general. I'd also recommend it to those who are interested in the lasting effects of the Holocaust, even two or more generations removed from the events. Thank you to TLC for having me on the tour! Click here for a list of other review stops. I love family discovery stories and spiritual journey stories so this book is right up my alley. This does seem interesting! I'm sticking it on my Goodreads TBR shelf right now. Seems right up my alley, being about both theological issues and genealogy to some extent. I really appreciate that you mentioned that the author seems honest and doesn't censor her story -- that's so, so important for memoirs, isn't it? I agree, I prefer memoirs that show the good, the bad, and the ugly. I think it's human nature to paint ourselves in a good light, so authors who can rise above that get my respect.